Trek right to the very top of the Everest Base Camp Trail and get the chance to sleep overnight at Gorak Shep at a lofty altitude of some 5000+ m - and then trek up to Kala Pattar to get awesome views of Everest, Lhotse and Nuptse - experience the thrill of the Himalaya - and of the wonderful Nepalese people and their culture. Only here do you have the World’s greatest rivers, the Highest Mountains, the most sublime valleys, and the crossroads between China and India. Wildlife abounds, and the opportunities for Adventure are too many to count. You will be escorted to this wonderful country, and introduced to the wonders of the Himalayan Kingdom. During the course of your trip you will get up close and personal with the Greatest Mountain on earth as you trek the whole way up to Everest Base Camp. The trek has been carefully constructed to climb high - whilst acclimatising correctly - to allow you the very best opportunity to get up close with the highest mountain on earth. Day 3 - Day 16 - Flight from KTM to Lukla, Trek from Lukla to Everest Base Camp, and return to Lukla for return flight to Kathmandu. Note - you will be using lodges throughout the entirety of your trek, and whilst basic, they will prepare food each evening and ensure that you have a roof over your head. NB - there are 2 extra acclimatisation days built in to this itinerary for you - in order to give you the best chances to succeed, complete, and enjoy this experience. *The flights detailed here are for illustrational purposes and are not included as part of the package. Adventure Café can assist in arranging flights with you. Please ask for details.The itinerary may vary slightly with the availability and timings of the flights - this will be confirmed at time of booking. Please note timings are approximate. Also please note that there are two systems to join this trek. In Kathmandu you will have a comfortable clean hotel with en-suite facilities (Nepalese Std.) - full of character and set in easy striking distance of both the tourist backstreets of Thamel and the main city centre and its wonderful temples. On Trek you will be staying in lodges - full of character, but chilly, and simple! Hotels will be located conveniently in the city centre at walking distance from a good variety of restaurants and also about fifteen minutes walk from the main square. Whilst in Kathmandu it is possible to upgrade hotels. It is also possible to offer single supplements. Please note - this is not possible on Trek ! All Meals on Trek, Internal Transfers to and from airports, Internal Flights, All Accommodation, Local Leaders, Porters and an Experienced international trek leader from the UK (depending upon group size). International Airfares - please ask if you require assistance with flights and we should be able to offer well priced flights with good connections. 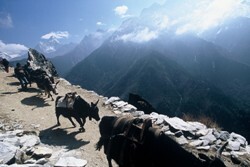 Excludes transfers in UK to airport, Bar Bills, Meals in Kathmandu, Snacks and Soft Drinks on Trek. Visas are not included, but are required for most nationalities. Visas are organised for UK nationals on arrival. 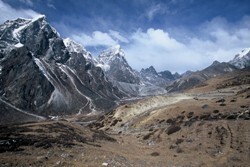 The best season to trek to the Everest base camp region is Autumn (from mid-September till November end), and Spring (from the beginning of March until mid-May). Temperatures will drop considerably as you trek higher every day. The nights are cold (between -10 C to 5C) but the days are sunny and hot (between 10C to 20C). The mornings are usually clear, with clouds building up during the afternoon, disappearing at night.